Oh yes its well sturdy, I forgot to mention the over engineering of the framework. It sits on 3" x 2". kjiwizard wrote: I am getting worried now reading the anti chipboard posts. I wouldn't worry too much, these are chipboard (albeit recently rebuilt on a nice ply frame to replace the hotch potch of bits of second hand timber they were originally screwed to) and they haven't warped in 20 years. i've had loads of problems but all of my own making - piecemeal extentions using melamine-faced chipboard of a different thickness, packing the track on off-cuts of balsa and card rather than cork, changing the track layout a few times, not building them square in the first place... None caused by warping. Having said all that, if I was starting again I would use ply, if only on the grounds of weight. There's an extension board to the right of that pic which is built from foamboard - I can pick it up with one finger but it's not really sturdy enough without framing it in ply. Talking of crap that goes into chipboard, I once stripped all the teeth off a jigsaw blade sawing up a sheet of 12mm chipboard for a diorama base. A pebble fell out. There is nothing wrong with chipboard! I have used formerly on at least three layouts. One was a portable exhibition layout too. I never have a problem with it sagging, but it was well braced on 2" x 1" PSE framing. The chipboard and the framing was also coated with varnish as the layouts were all stored in a remote from the house garage. As I said in my first post on page 1 ... Chipboard. Very heavy and almost as hard to drive those Peco track pins into as MDF. Crumbles after several years too (Or at least the older types of Chipboard did). If you're happy with its weight and its hardness, then I see no problems. While I appreciate that some of you have had no problems with chipboard I have had some pretty horrible experiences. Obviously if you stiffen it enough with wood you may avoid the worst things, but weight will get you. I have two legacy chipboard boards in the fiddle area of my layout. They sit on MFI kitchen units which gives them a lot of support and they seem to be OK after nearly twenty years. However you need to know that my outfit resides in a custom built room in the house which is air conditioned (keeps the track clean) and temperature controlled to 2 degrees C so this performance cannot be taken as typical. Before I went the plywood route I used 'open frame' boards where only the trackbed was plywood supported on a wooden sub-structure. This is also quite light but needs a bit more carpentry than the plywood box construction. You pays your money and takes your choice of back problems. I wouldn't change back now. I am completing my 4mm layout of Killiecrankie. I am the LMS Society carriage person. Is that a typo or do you have to dress like an eskimo to operate your layout? Was this post originally asking for advice or has it turned into a chipboard bashing thread? As long as the room isn't damp, prone to excessive rise and falls in temperature then there will not be any kind of problem regarding the choice of material. Everyone is going to have their favourite methods and materials to use. Remember a lot of people on here are quite young and therefore probably not as finacially solvent as some who have paid off mortgages and progressed up their chosen career ladder. I think the latest post above says it all. I have successfully used chipboard for years without any swelling, warping or movement, because a very strong timber grid frame underneath hold the lot together. Yes it is heavy but perhaps more durable than plywood in the end! Blimey! Talk about resurrecting old threads!! You'll find a lot more about baseboards and their construction in more recent threads, 47Fan! I used chipboard when I was much younger, and in a permanent layout in a dry place that isn't likely to be moved for donkey's years then it's ok and, primarily, it's cheap... But there are a lot better materials for use as baseboard surfaces, believe me, I've tried them! strangeworld57 wrote: Hi all. This is the first time ive posted anything here. I would like as many peoples opinions as possible. my reason is for this is cost. Hi SW,,,,,,,,,,,, Have been making baseboards from timber frames and chip board for many years. Have used it in loft and in sheds which both had damp problems in winter because of weather and also use the stuff inside the house as well. Apart from the fact it is heavier than ply I have never had any problems with it warping cracking or anything else for that matter. My latest baseboards I used 12mm plywood because lots of people were saying that it was better than chip board. I now must say that i have had more trouble with the ply than I ever had from chipboard. I do not not agree that ply is better than chipboard and if I build any more new baseboards will be using chip again. When it come to warping ply is much more likely to warp than chipboard in fact some of the ply which was delivered to me was warped from new. One of the boards was so badly warped it was scrapped and used of small sections on level two. I have never had problems like that using chipboard. Far as I am concerned ply wood is very expensive and the extra cost is just worth it. The only advantage with ply is it is lighter than chip. Sometimes I think people just like change for change sake. Love the idea of chest of drawers for supports. I used kitchen base units for my last build and now have plenty of under storage space for all my railways stuff. I'll add to an emerging consensus(? ): n'owt wrong with chipboard for layouts, main exemption being for portable layouts or removable sections where weight can be a ruling factor. I also have used cheap flatpack furniture (and on another occasion plastic shelf units) as the sub structure, for convenience, storage and neat appearance. Once on a mobile, but not portable, layout. 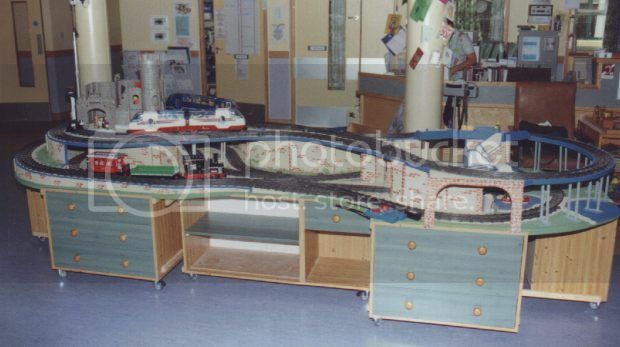 16 x 5, G scale for a hospital children's ward. The whole thing on castors for cleaning purposes, 2 x 1 strapped each furniture clump together, and suitcase latches held the three clumps as one assembly. Stanier wrote: I thought the OP would have taken note of the advice that chipboard is a no-no for baseboards these days. It is basically unstable and will change its shape without much warning no matter how much stiffening you do. Hi Stanier you are a ply wood man I can tell. You know my first layout which I built in the 1960s was 2x1 framed covered in 1/2 inch chipboard. That layout is still in use after having several railways built on it over the years and it is now in my Nephews house and his kids still use it and it is still nice and flat in good condition showing obvious signs of ware. Thats not bad for nearly 50 years is it. Some of the ply wood I ordered last year for my present construction, one sheet of which was delivered so badly warped it was only suitable for level two or upper levels in smaller pieces. The real difference is, there is none! Both are manufactured with a hydroscopic (water absorbing) glue and will laminate/warp if allowed to get damp. Its the wood that absorbs the water and expands. Either will distort if allowed to get damp. This has to be the best reply up to now. Dont think any of us modellers was thinking of using the chipboard anywhere other than inside a building. I had a large layout years ago using ordinary chipboard which was in a cold damp loft in winter anyway. That survived for many years and part of it is still in use. That it 45 years old now.